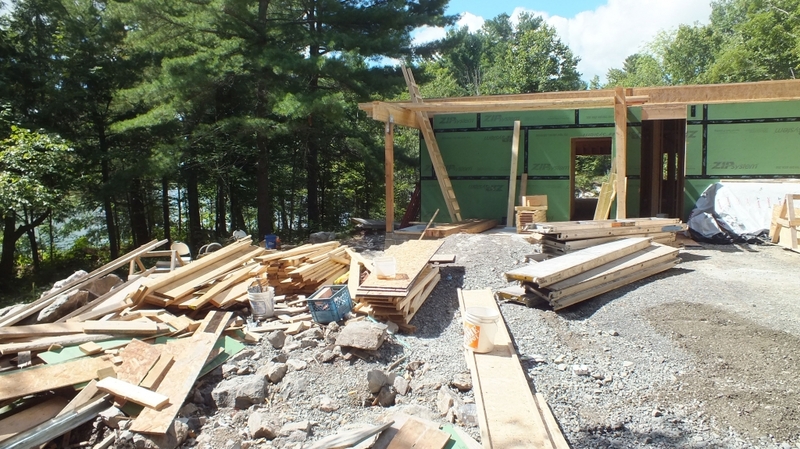 If you’ve only seen our blog, you might not know that Solares has a soft spot for rural builds. Before building Toronto homes, Solares’ very first project was a rural new build: a 2,775 sq.ft, 2-storey house in Gananoque, in 2005. Ever since, Solares has built and designed urban new homes, rural builds, urban renovations, and rural over-hauls. Don’t get me wrong – We love urban projects, but there’s something especially satisfying about getting our hands dirty in the Ontario countryside. 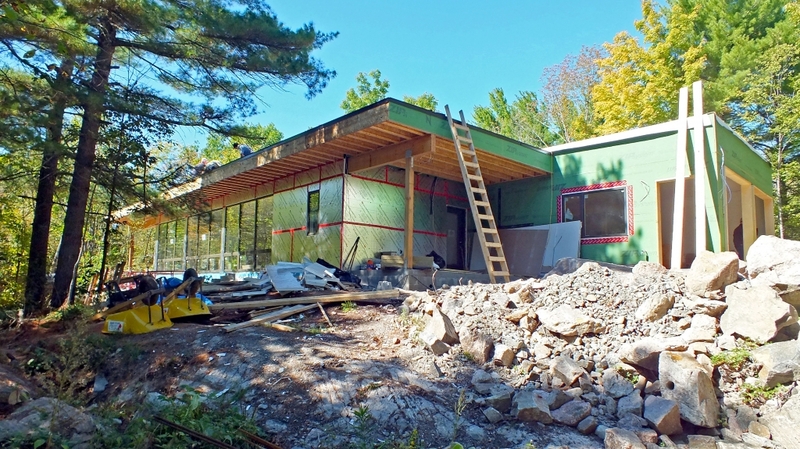 We’ve headed again outside Toronto to do just that – get our hands dirty on a rural new build! 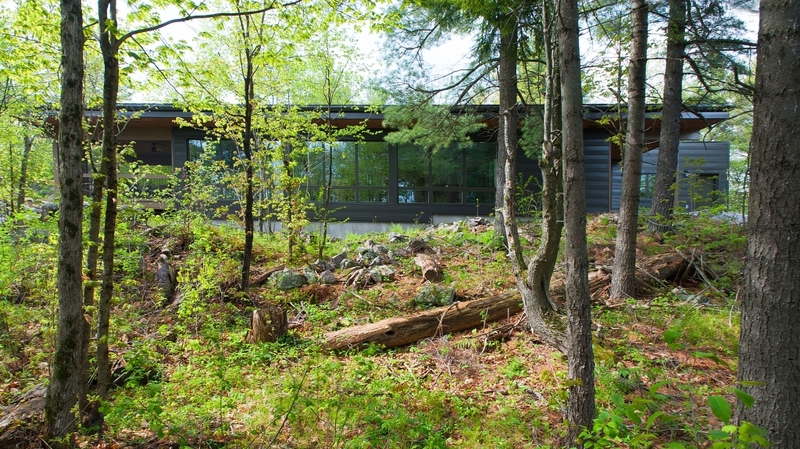 Frontenac House is a brand new project, shrouded by forest, perched on a rock and overlooking a lake – sounds like a refreshing change from the hustle and bustle of Toronto’s busy streets, doesn’t it? First of all, the project site is beautiful. 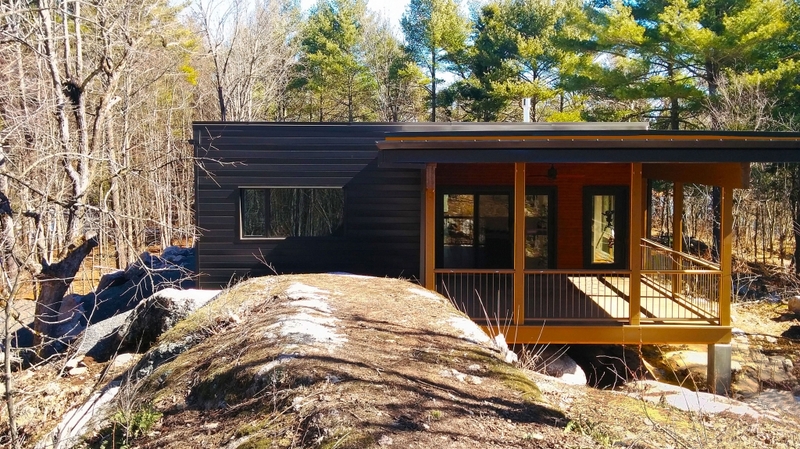 In picturesque Eastern Ontario, the small 5-acre lot is pinned between trees, granite rock outcroppings to the west, and cliffs to the north and south. The southern cliff gives way to a beautiful lakeside view. This is a huge advantage to the property, because southern exposures collect the best sun. The property’s southern clearing makes this site perfect for a passive solar home, which is designed in relation to the sun, in order to collect and deflect natural light and heat. Secondly, our clients are awesome and pragmatic nature-lovers. She’s a nature-blogger and freelance writer. He’s a project manager who works half the week in the city, half the week at home. Together, they spend their free time seeking wonder and respite in equal parts. They enjoy the peace and quiet of country living, and like thoughtful, restful activities like reading, yoga, and hiking. What a perfect place for them to set up shop! Because of their love of nature, they wanted to make sure their home made as little disruption to the surrounding environment as possible. They wanted this home to be a home that would exist alongside the environment, instead of controlling it. Plus, they wanted a home where they could grow old together. And thirdly, this build will be HARD! Not too hard, of course – We’ve mastered hard builds in the past. But it will certainly be a challenge, and we sure love a good challenge. 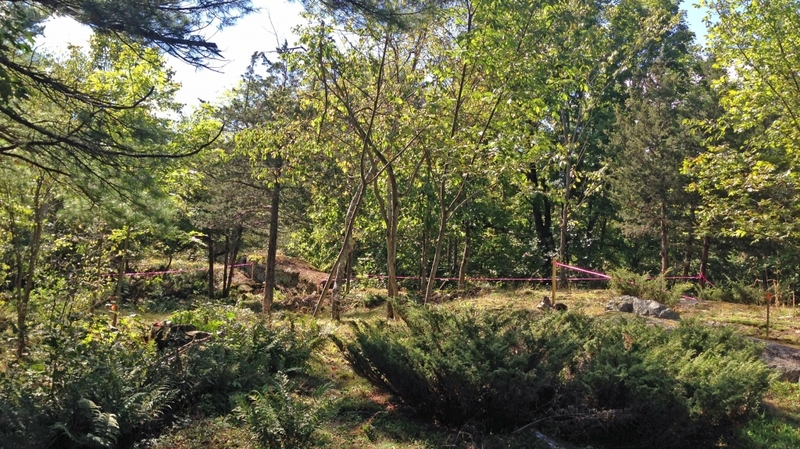 The lot, because of the granite rock outcroppings and forest, has only one small clearing, and even that restricted area is rocky, uneven, and nearly impossible to build on. Nearly! Aside from that small space, our clients had important requests, like an at-grade entrance to ease potential future mobility issues years down the road, and a covered garage to keep their car safe from the frigid Ontario winters. Our clients also wanted their forever home to meet as many Passive House standards as possible, a feat Solares loves to strive for. With all these factors, we sure have our work cut out for us. 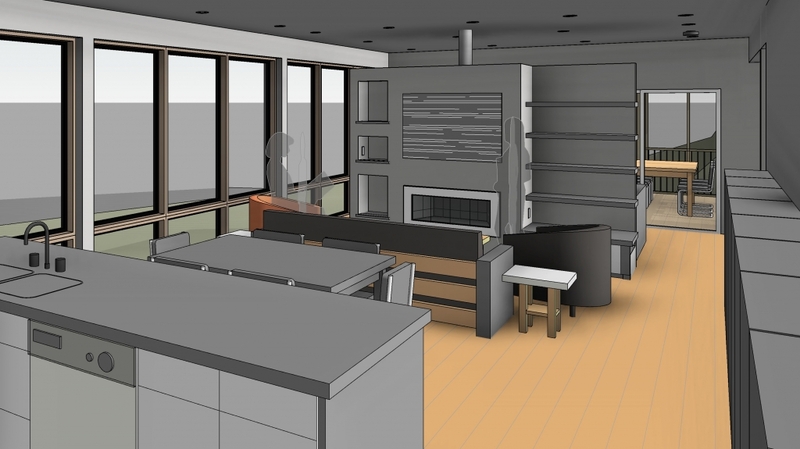 I’ll be following this project through the design phase, its construction, structural work, envelope, systems, and interiors, and this will definitely be an exciting project to see through! It’s time to show you Frontenac’s floor plans! Or should I say “floor plan”, because this new build will be a compact single-storey, sunken into the landscape and surrounded by nature. For those of you who need a refresher, Frontenac House is on a beautiful eastern Ontario lakeside lot, circled by forest and cliffs. 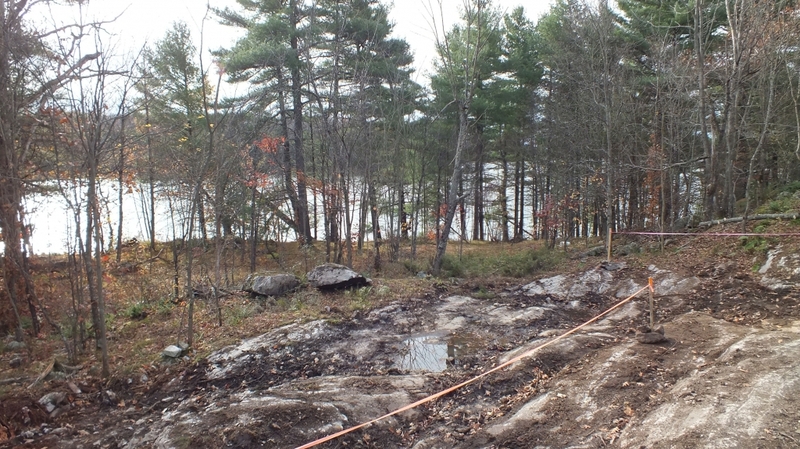 Sitting at 5 acres of land, the lot is compact yet replete with natural features like granite rock outcroppings, tall spindly cedars, maples, and birch trees, and a sloping southern lakeside view. The lot, though lovely, is difficult and irregular – with only a small patch of build-able land which made designing (and building!) on the property challenging. Our design takes all that into account and celebrates the property’s features, like the large rock outcropping on the north-west corner of the house site, affectionately nicknamed “The Whale” for its uncanny likeness to a breaching whale. But the house doesn’t just compliment the property – the home is also tailored to our clients’ needs, so the finished product will be a practical and relaxing haven for the couple to spend years in. The front foyer is on the east end of the house, preceded by an enclosed garage and a small front porch. Also leading off the foyer is the laundry/mechanical room in the southeast corner of the house, and a small coat room. Through the foyer the house splits into two main areas: the great room along the south wall, and individual bedrooms, bathrooms, and an office on the north. 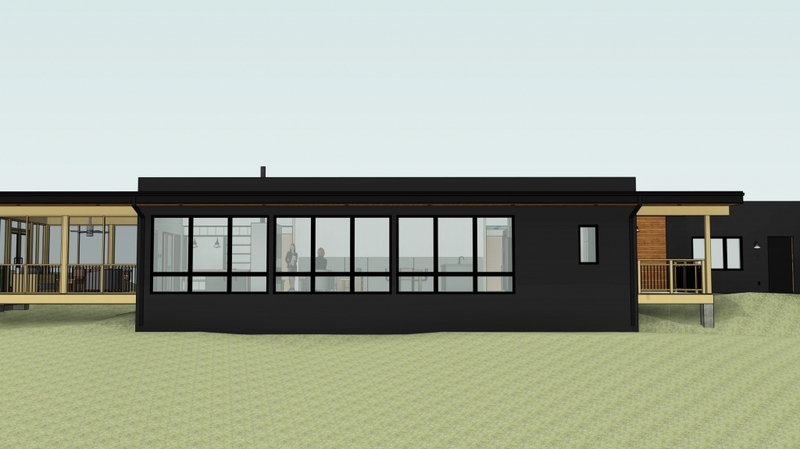 Large south-facing windows fill the south wall, to collect the sun’s warmth in true passive-solar spirit. 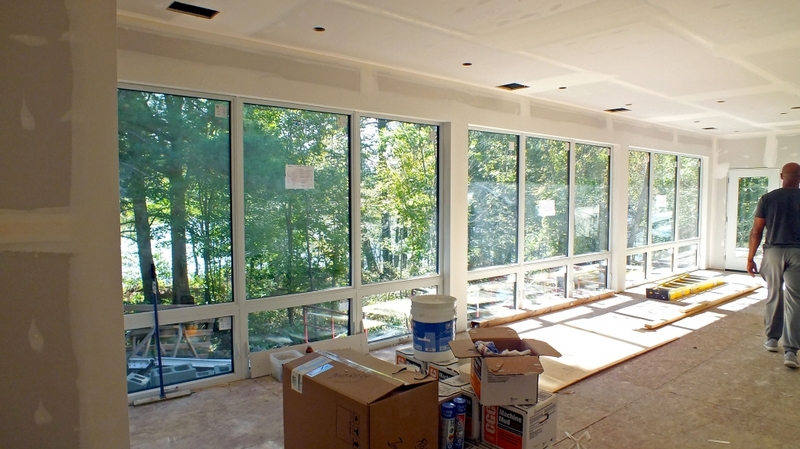 Plus, the lake’s orientation to the south is an added bonus – the views of the lake through these windows will be breathtaking. A compact kitchen island stands between the kitchen and dining area, perfect for food prep and dinner party bartending. The sitting area is just beyond the dinner table, with the room’s piece de resistance: a large free-standing fireplace which partitions the living area from the wife’s office. As a writer, she wanted the freedom to move, pace, and walk throughout the house while brainstorming, but also needed privacy to be able to concentrate. Just a few steps away are the master bedroom and the enclosed porch. The porch includes a screened-in sitting and dining area so the couple can enjoy the outdoors bug-free in the summer months. 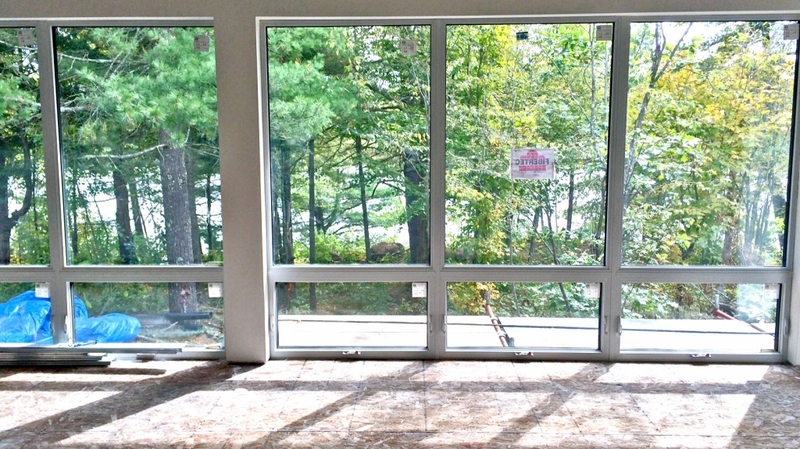 The Great Room’s north wall will be left blank where the couple can exhibit their proudly owned works of art. 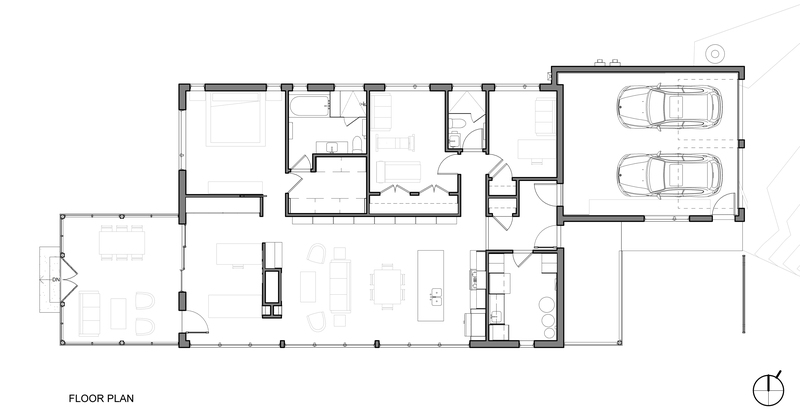 On the north side of the house, the foyer splits into a small hallway that leads to an office, a small bathroom, and a room the couple will use as a gym/tv room/guest bedroom. The office tucked in the northeast corner will work well for the husband, who likes his own space when he works from home. The private office also means any phone calls with his clients or colleagues won’t disrupt his wife’s creative flow. The master bedroom sits in the far northwest corner, with a view of “The Whale” and a large walk-in closet and en-suite bathroom. Next time I talk about Frontenac House, I’ll be focussing on all the grunt-work of making this design a reality: site prep, the foundations, construction of the floors, walls, and heavy-duty flat roof. This place is going up fast, but we’ll keep trying to catch you up to speed! It’s time to talk about the structural ins and outs of Frontenac House. 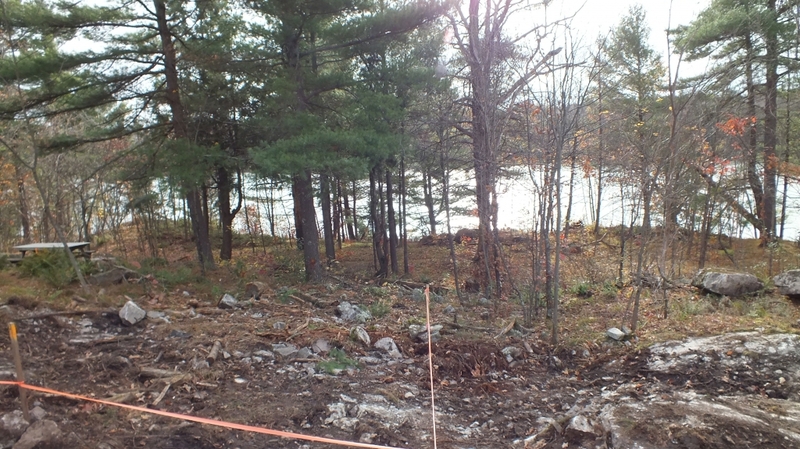 On a small, rocky lakeside property lined by cedars and cliffs, this project is a challenging one to build. 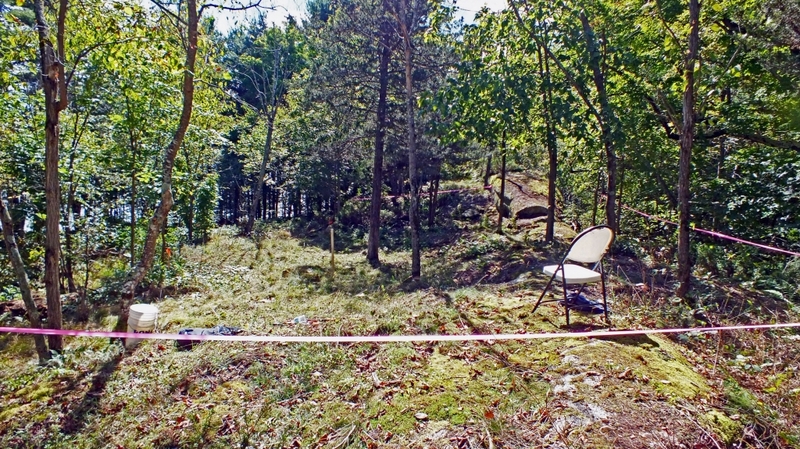 The property, though beautiful, is incredibly irregular, with cliffs, dips, tree roots, and a large rock outcropping making up most of the buildable land. To put it simply, rock outcroppings do not lend themselves kindly to the construction of a building. Building on rock is not always a problem — bedrock acts as a natural foundation, and a building built on rock will never sink. But when rock is irregular or uneven, the only options are building the home on stilts, raising the main floor up over the undulating base, filling the spaces between the rock with engineered fill or blasting the irregularities away and building straight on the flattened rock surface. 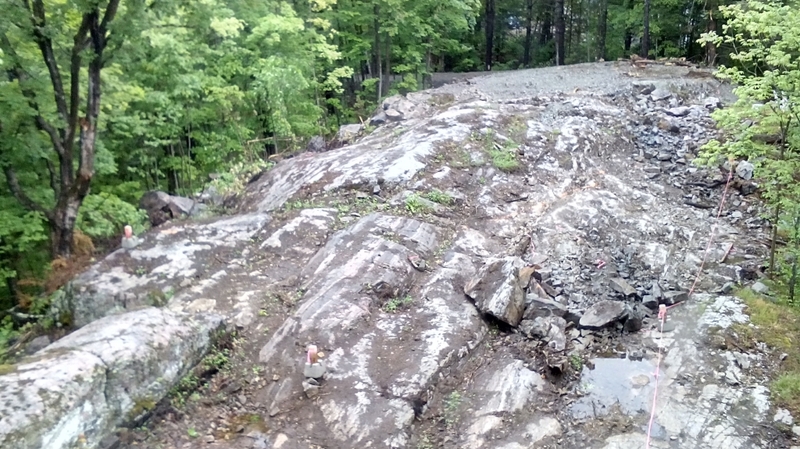 After very careful consideration, we decided on a hybrid approach of blasting some of the highest points of the formation and filling remaining dips and trenches with a compacted engineered fill base. We put a lot of thought into this decision. 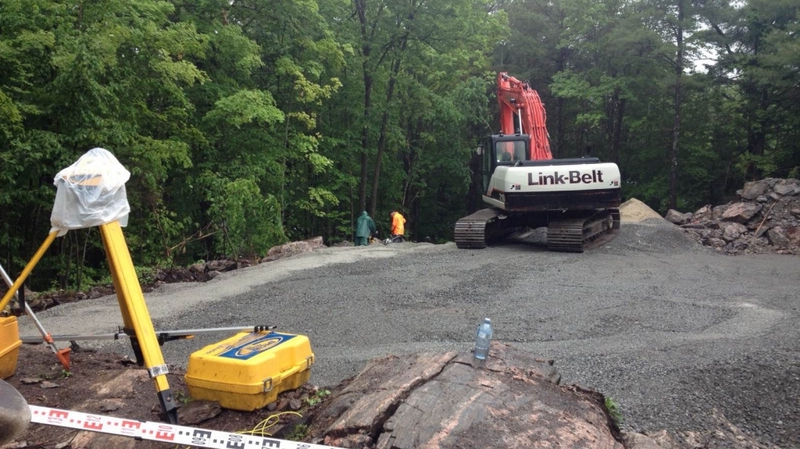 Blasting is time consuming, expensive, and in this case, puts a permanent scar on a 250 million year old rock formation. However, a small amount of blasting would allow for two important things: It would allow us to maintain a smaller envelope, which would make for a more energy efficiency building. It would also allow the house to be kept snug against the ground, which would make it more hidden from view and would keep it completely accessible to our clients as they “age in place” gracefully. It was a tough decision to make, but we were at peace with it in the end. Another structural challenge was ensuring there was no step between the garage and the house, an accessibility must. An at-grade garage is clearly necessary so cars can drive straight in from the driveway. But building an entire home this low is much more complicated — one has to take into account the depth of the floor joists and the height of the siding so close to the ground. 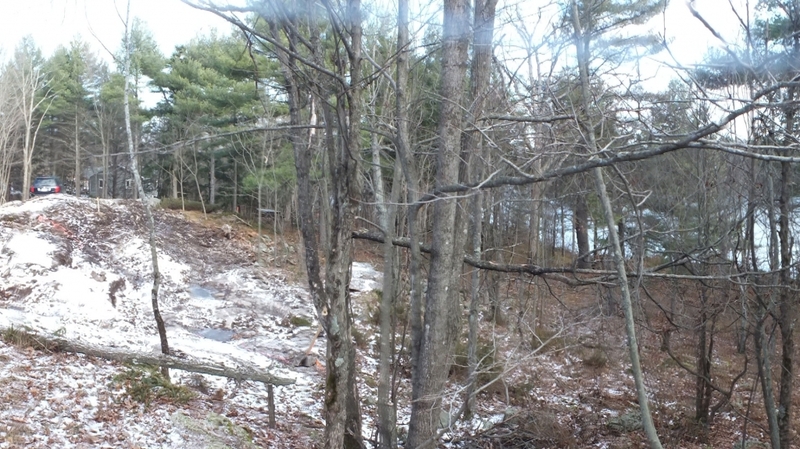 Thankfully, Frontenac’s property slopes downwards, which made this a little easier. The garage is located above the bedrock, and – save for the small area of rock that jutted upwards and needed our attention – the rest of the bedrock falls below the home’s footprint, which made building low possible. Once our property was level, we laid down a layer of gravel for drainage. 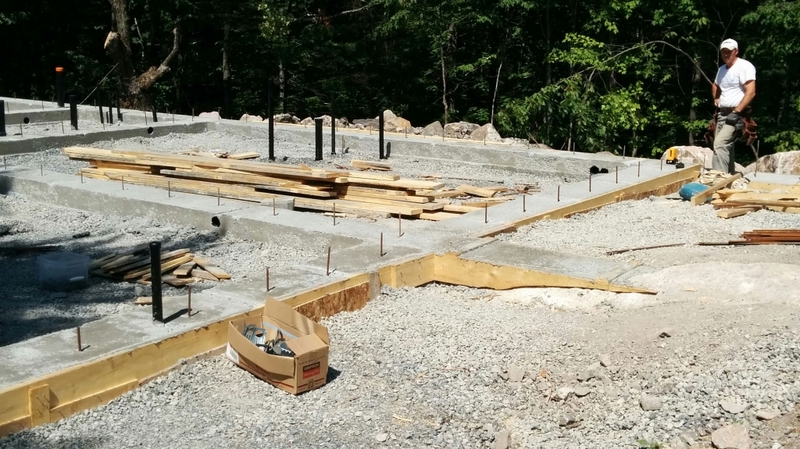 Then, we cast footings that hugged the undulating rock, and placed short ICF (Insulated Concrete Forms) foundation walls onto these footings. 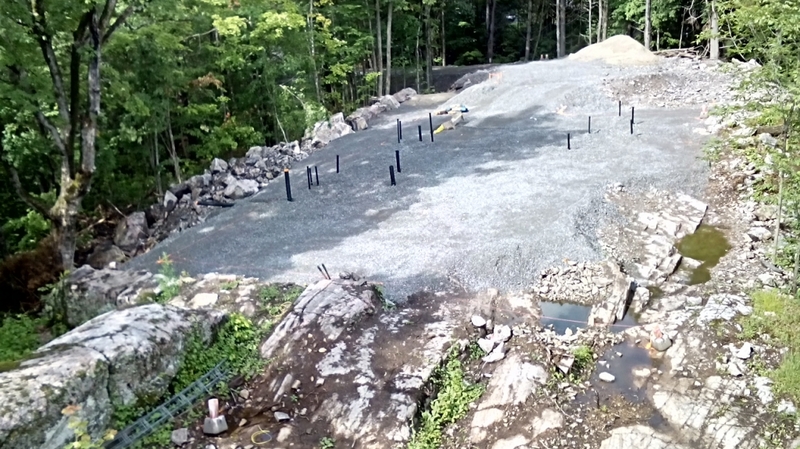 It was strange not to have the typical 48” of coverage over the structure’s footings, but knowing that the house was sitting on solid bedrock quelled our fears. 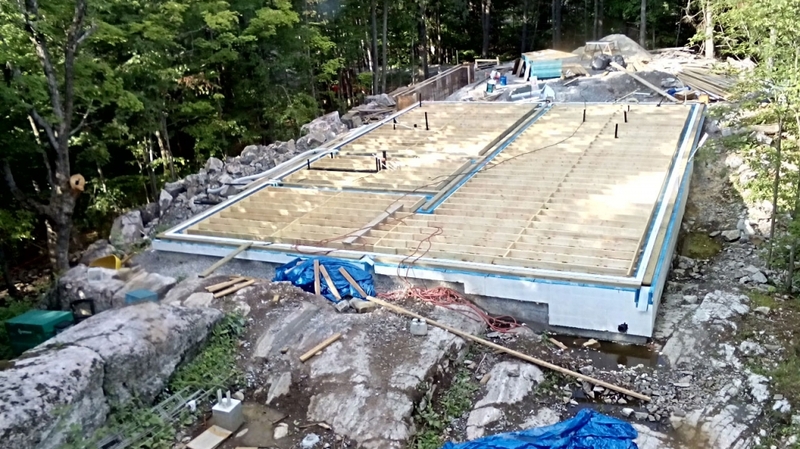 We erected the wood-framed floor on top of the ICF foundation walls, a change from the conventional slab-on-grade in most houses without basements. We packed insulation under the floor— we had to be sure it was well-insulated, since any temperatures from the bedrock (which is slow to heat up) could seep into the house without proper insulation. Plus, with no basement to allow access to the ground floor’s pipework and insulation from below, all pipes and drains had to be meticulously planned and laid into the gravel base before the floor went in and the walls were erected. 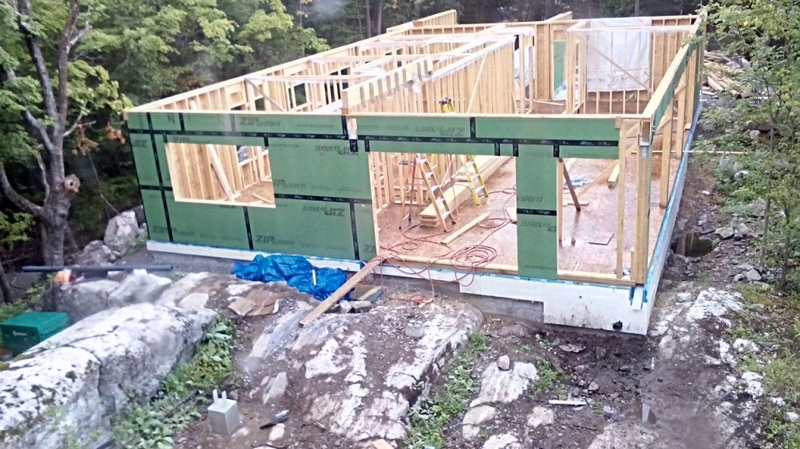 After the floor was framed, we erected our 2×6 wood stud walls with ZIP System wall sheathing (more on that in our next post). And finally came our wood-framed “flat” roof, yet another huge challenge in this complex build. I say “flat” because no roofs are truly flat. A completely flat roof would collect far too much snow and rain, and too much additional mass (beyond the roof’s existing weight) would eventually cause the roof to cave in. All roofs need at least a minute slope, to defend against the elements. Even with a small slope, a “flat” roof still needs to be able to withstand much more weight than the average peaked roof. Snow, leaves, and rain pile up much more than they do on steep roofs. But to many, the benefits of a low-lying roof are worth the construction difficulties. Our clients love the modern and fashionable aesthetic of a flat roof, and wanted their home to lie low and blend into the landscape. We built the flat roof strong enough to handle more than double the normal weight requirements. The roof needed to be able to withstand the weight of solar panels plus the worst possible outcome of snow/precipitation collecting both under and on top of the panels. Our builders were quick out of the gate on erecting this house, which makes it an exciting project to follow. Next time, I’ll fill you in on the insulation and our air-tight envelope – a serious endeavour! Frontenac House, our small one-storey build on a rural lakeside property, went up so quickly it was as though it was built by magic. 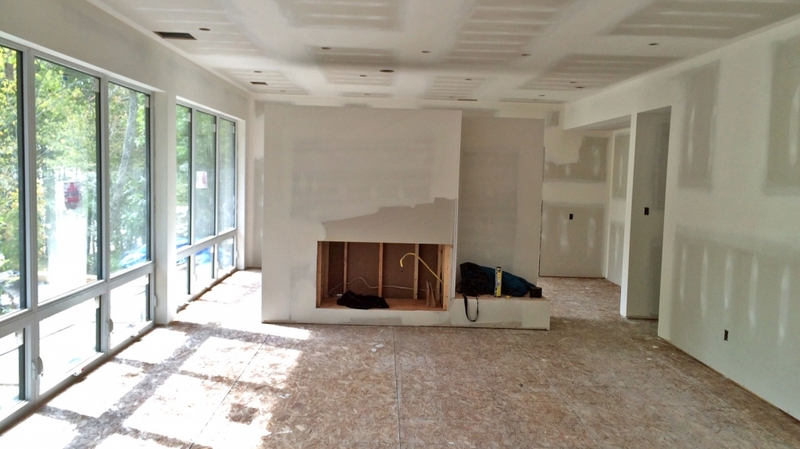 Our builder, Michael McGonegal, as well as our two clients, were eager to get this house up and running, and made the process look so easy! But in reality, building this house took a lot of hard work, quick thinking, and careful execution. This house was a great exercise in balance. Because of the property’s rural, off-the-beaten-path location, we had to be flexible and creative with certain choices. Some materials we were set on using were unavailable in the area, which meant quick unexpected decisions needed to be made. On the other hand, other aspects of the house had to be immaculately planned and followed out exactly, like the placement of toilets, showers, and sinks. Those had to be measured out on the property early on so they correspond to the drainage systems being installed in the engineered fill on top of the bedrock – far before the structure was even built! But balancing imaginative creativity and meticulous measurements is really what being an architect is all about. Thankfully, the basics of our structure, envelope, and insulation, are a bit more straightforward! 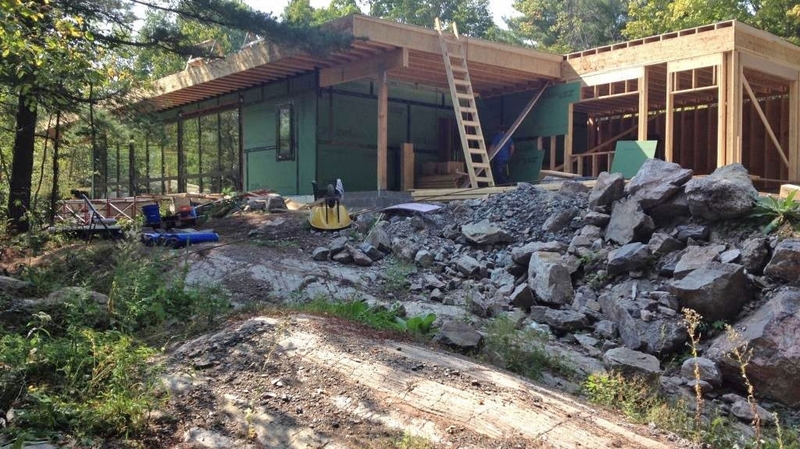 In our last blog post on Frontenac house, I talked about its conventional stick-frame construction, its slightly less conventional wood framed floor, and its contemporary “flat” roof. This post, I’ll fill in the blanks of the structure with insulation and talk about its “Perfect Wall” assembly. 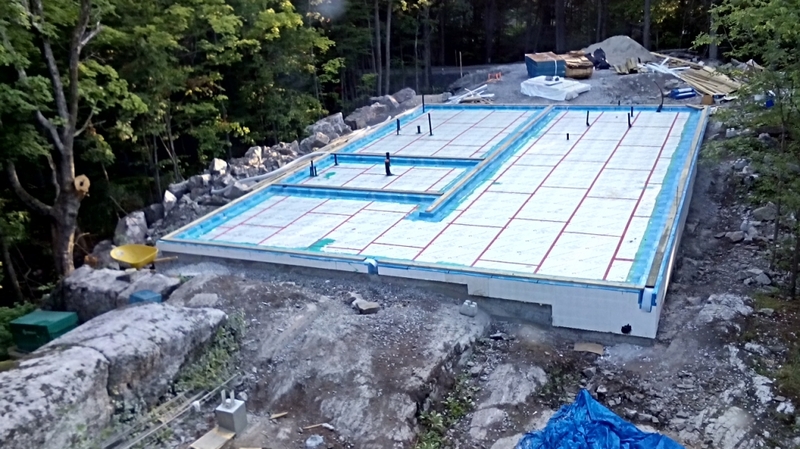 Our air-tightness comes from the innovative ZIP System wall sheathing by Huber Engineered Woods, a plywood sheathing with an airtight rubberized coating and a built-in vapour permeable water barrier. We were set on using ZIP System wall panels, but were concerned it would be difficult to find in the rural area, like many of the materials the building had been designed to use. Huber’s ZIP System is made in the US, and is only just beginning to make its way north, so we were thrilled when we found out Michael had used it before and knew exactly where to source it. 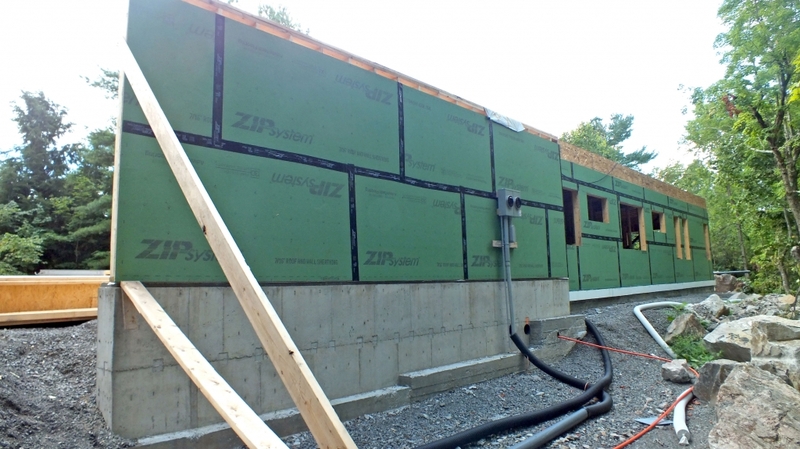 These sheets of ZIP System wall sheathing simply have to be taped together to create a seamless, airtight sheathing fastened onto the structure’s wooden studs. ZIP System sheathing is air-closed, but vapour open — it’s airtight, but it “breathes” in terms of vapour. Vapour is controlled by the polyethylene sheet stapled to the inside face of our batt insulation. 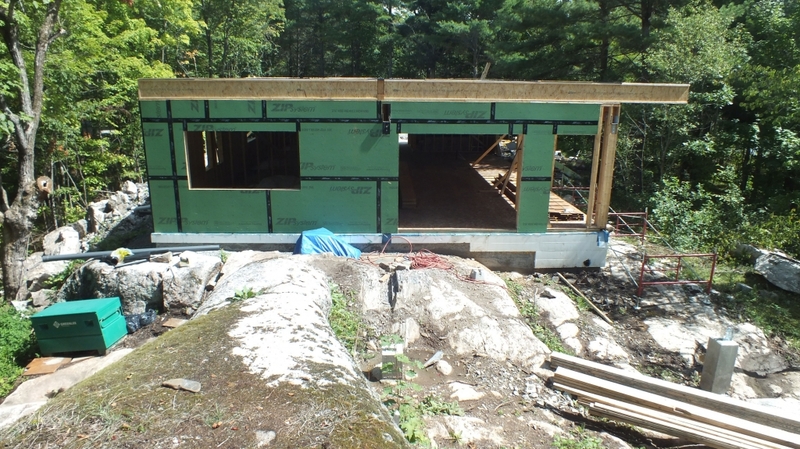 After our ZIP wall sheathing structure was assembled, we then insulated both within the wood studs as well as on the exterior of the structure. 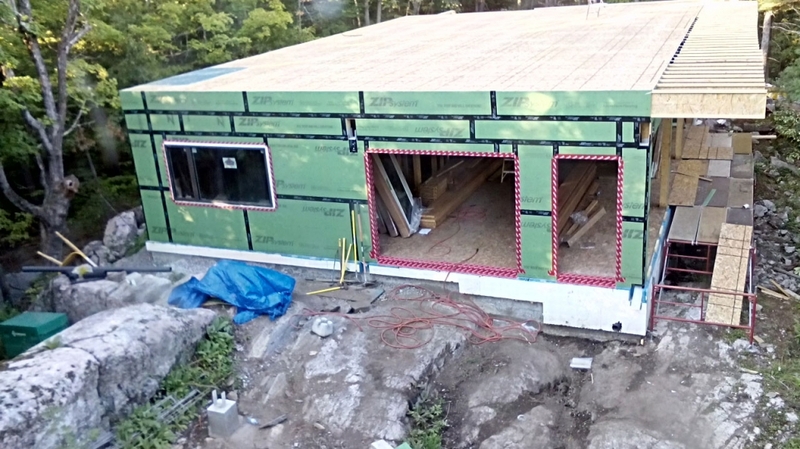 We used 2 inches of Roxul mineral wool rigid comfort board as the exterior insulation, and 5.5 inches of mineral wool comfort batt for the insulation set between the wood studs. We’ve mentioned before how much we like Roxul Mineral Wool: it’s much less damaging to the environment than other forms of insulation like spray foam, it’s made completely of recycled materials from the mining industry, it has no polluting aspects, and it’s healthy and easy to install. All this mineral wool gave us an R30 wall. Joe Lstiburek aptly calls this type of advanced air-tight framing with exterior insulation the “Perfect Wall”, which has all four principle control layers (a rain control layer, an air control layer, a vapour control layer, and a thermal control layer) on the exterior of the structure, all capped with an aesthetically pleasing cladding whose only job (besides looking nice) is to act as a rain screen and an ultra-violet screen. We pretty much followed a perfect wall assembly exactly, with the ZipWall sheathing as air barrier, the interior and exterior insulation as thermal control, and the polyethylene sheet as vapour control. Think of putting on a fluffy parka when it’s cold outside. Where the ZipWall is the airtight layer of the parka (the outer shell), all our insulation acts as the fluffy down that the parka is filled with. Our “Perfect Roof” is quite similar to our “Perfect Walls”, just turned horizontally. 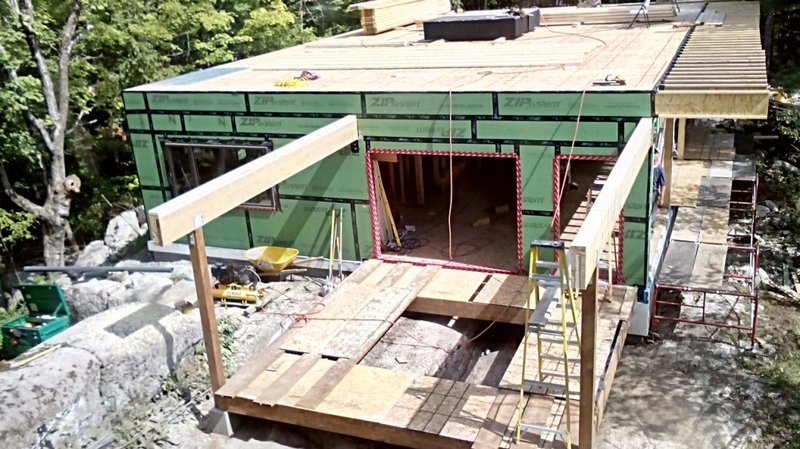 Our roof joists are covered with sheathing, topped with a fully adhered tight vapour and air closed membrane and exterior mineral wool insulation right on top of the flat roof structure. The only difference between our roof and walls was our interior insulations; Instead of Roxul batts, we opted for a vapour open, 1/2 lb open-cell foam sprayed between roof joists. Insulating the roof structure’s exterior had one other great benefit. As we said last Frontenac blog post, no “flat” roof is truly flat. All flat roofs need a slight slope, to help snow, rain, and leaves on their descent to the ground. And our roof’s slight slope wasn’t part of the roof’s structure — it came from our exterior insulation. We used Roxul Batts which were custom cut for the roof and came with a built in slope. This tapered mineral wool took out the guesswork of our “flat” roof. Finally, our roof was to be topped with modified bitumen – or so was the plan. A mod-bit roof, comprised of black tar sheets which are torched together, is pretty customary for flat roofs. It’s fairly inexpensive and airtight. However, we weren’t particularly thrilled with having to use mod-bit, because the only colours you can get it in are black and dark grey, and both colours are great at absorbing heat all year round, which is a real problem in the summer. However, due to our budget, it seemed like the only option. However, our builder was unable to find anyone in the area that could install a mod-bit roof, which turned out to be a blessing in disguise. After brainstorming, we came up with an alternative that was even less expensive and even more beneficial to the structure than mod-bit! 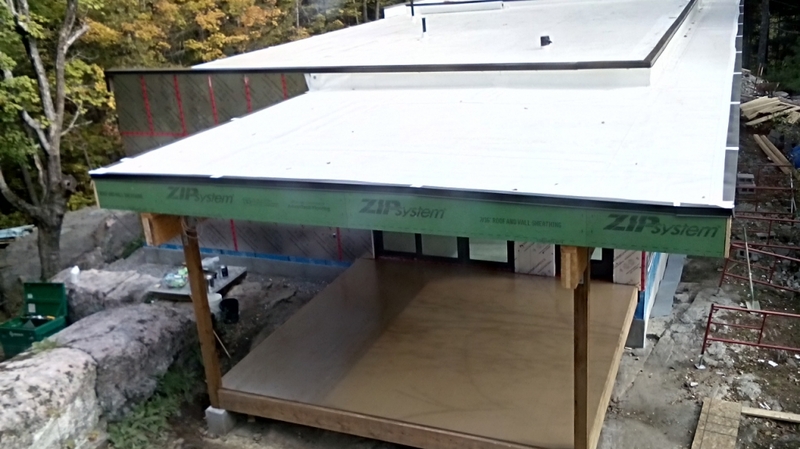 We settled on a TPO (Thermoplastic Polyolefin) roof. TPO is a single-ply, reflective roofing membrane which, instead of being torched together, is polymerized (or chemically bonded) together. TPO has pretty similar characteristics to mod-bit, but with one huge advantage – it’s white instead of black. As white reflects light and heat, our TPO roof does a great job in bouncing heat off the roof, so our insulation has to do slightly less work. Our mod-bit crisis actually gave us an even better roof than we had planned for. 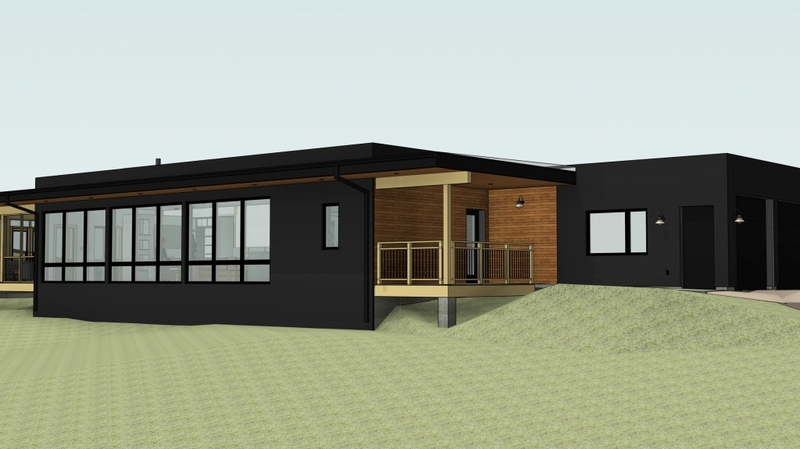 Next in this house we’ll discuss its extremely efficient systems – then the interiors, and then move-in! It’s hard to believe it’s happening so fast. 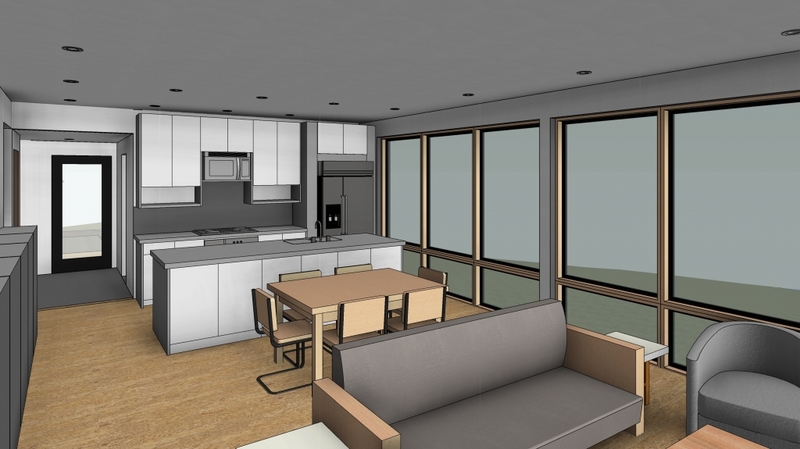 It’s time to talk about the systems in our compact Frontenac House. 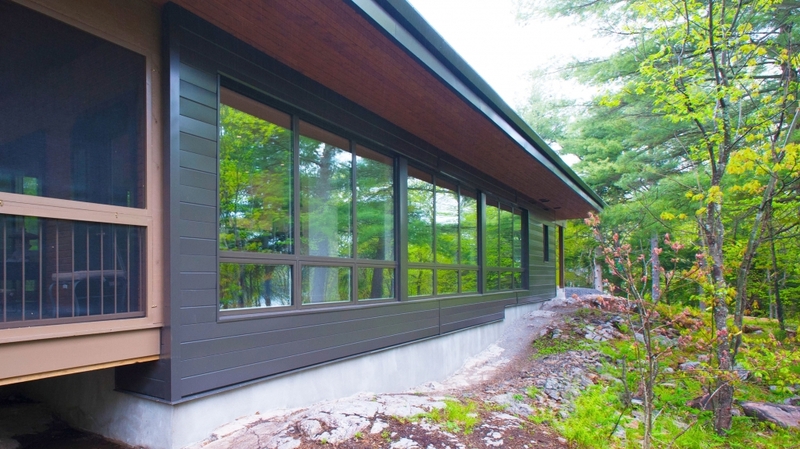 We’re as proud of this rural home’s systems as we are of its airtight and well insulated envelope. Besides a small propane tank used for the freestanding fireplace, only three or four times bigger than the kind linked to an outdoor barbecue, the whole house is run entirely on electricity! 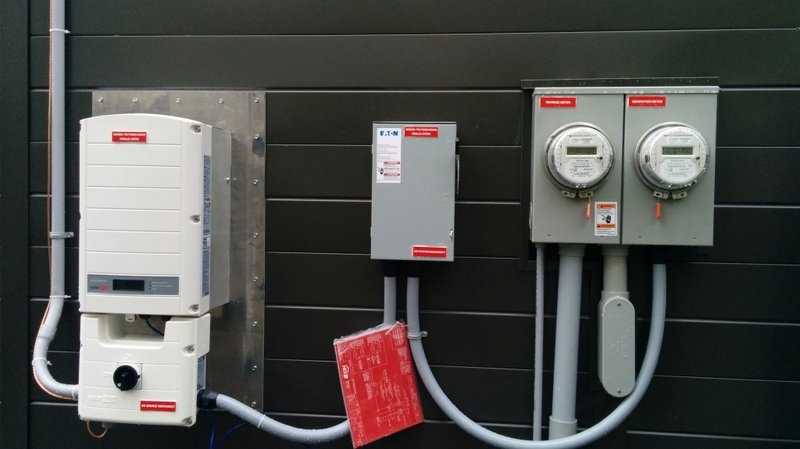 The home’s systems are fairly standard – for Solares projects, that is. 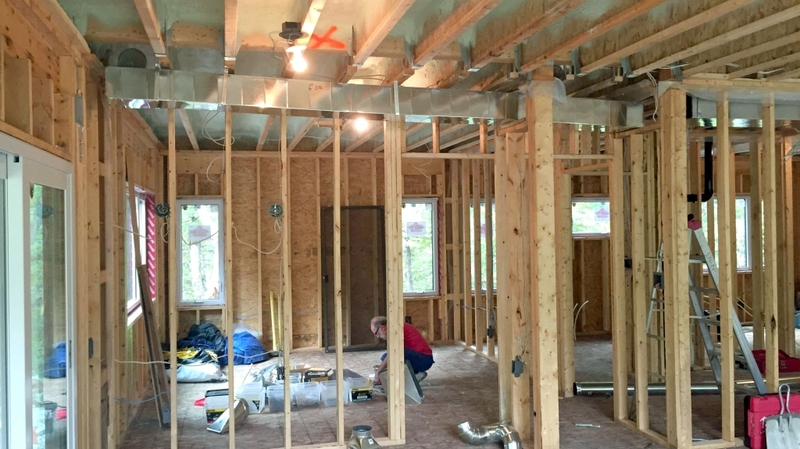 An electric heat pump mini-split is used for cooling and heating the building, and an Energy Recovery Ventilator (ERV) unit moves fresh air throughout the house through separate ductwork. 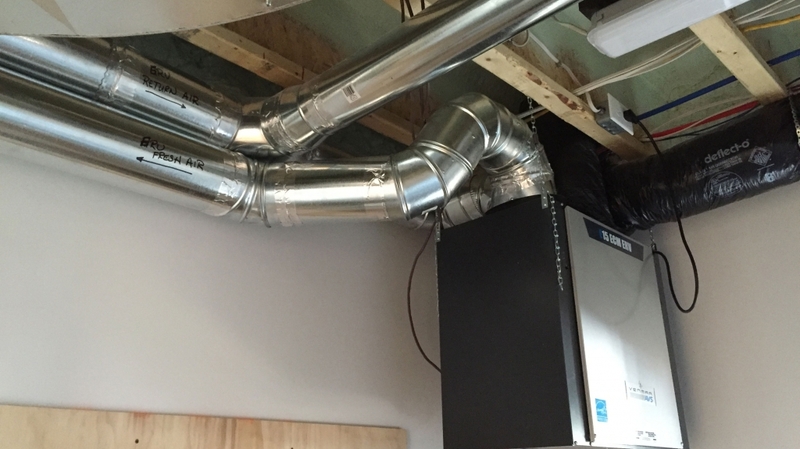 The house conserves energy by using separate ducts for the heat pump and for the ERV. For fresh air ventilation, it’s best to remember that a little goes a long way. Sure, you can just open a window if your house gets stuffy, but conditioning huge amounts of fresh air takes a lot of energy. For example, cracking a window in the winter means your heating system has to work overtime: All the inside air it worked so hard to condition goes – quite literally – right out the window, and now it has to start from scratch to heat new, cold, and unconditioned air. Not the best for energy efficiency – or for your heating bills. With an ERV, small amounts of fresh air is introduced in a controlled way. The ERV also expels stale indoor air. But first, it retains the outgoing air’s heat and humidity levels, and transfers it to the new, incoming fresh air. That way, the air is still fresh, but the temperature and humidity levels stay comfortable and constant inside – no more overworking your systems! As Tom always says, “seal it tight and ventilate it right”. Giving your heating systems a well-earned rest comes as an added bonus of following this mantra! Because the ERV doesn’t need to move a ton of fresh air throughout the house, the ERV’s ductwork can be small – only 4 inches round to be exact. However, the heat pump needs to be heating, cooling, and conditioning air in large volumes, which makes larger ducts the smarter choice for the mini-split. 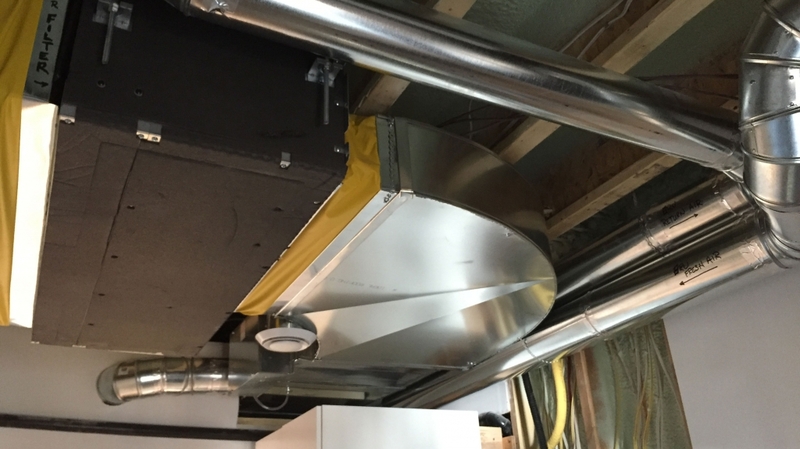 Though you can combine both functions (the ERV and the heat pump mini-split) into the same ductwork, the ERV has to work much harder to push the small amount of fresh air it collects through large ducts. With separate, smaller ducts, the ERV’s fan doesn’t have to work overtime. We’ve also equipped this home with other clever ways to use and re-use heat, like a condensing dryer and a heat-pump hot water tank. The condensing dryer looks like a conventional tumble clothes dryer. However, instead of venting the hot air and moisture, as a conventional dryer does, it vents the heat into the house, and the moisture goes down the drain. Not only does this recover heat from the dryer to use for other purposes, but it also doesn’t add any holes to your envelope, because the air doesn’t escape from the house through a vent. 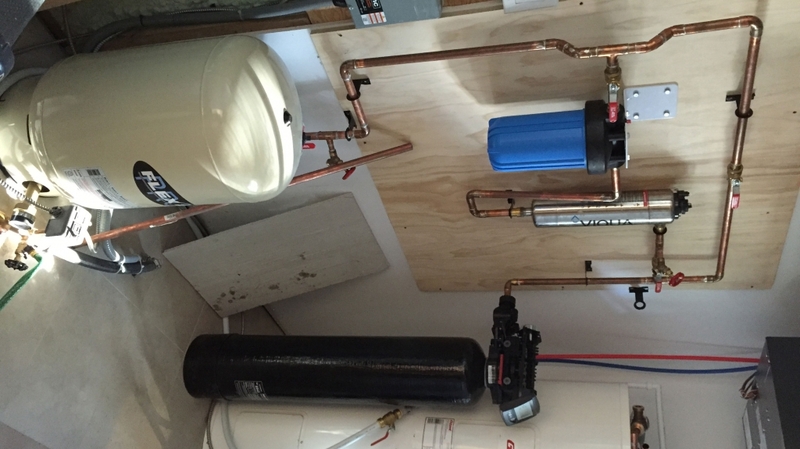 The heat-pump hot water tank is another clever energy-recycler. 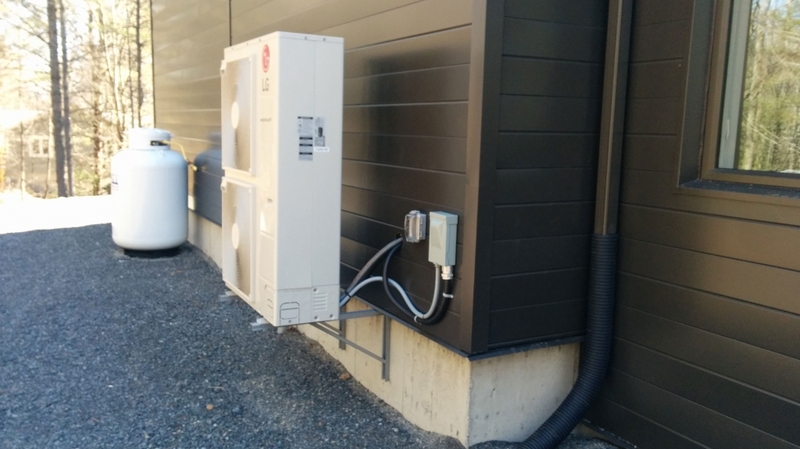 The heat pump heats the water in the water tank by taking heat out of the air, just like the mini-split’s condenser/compressor placed outside. 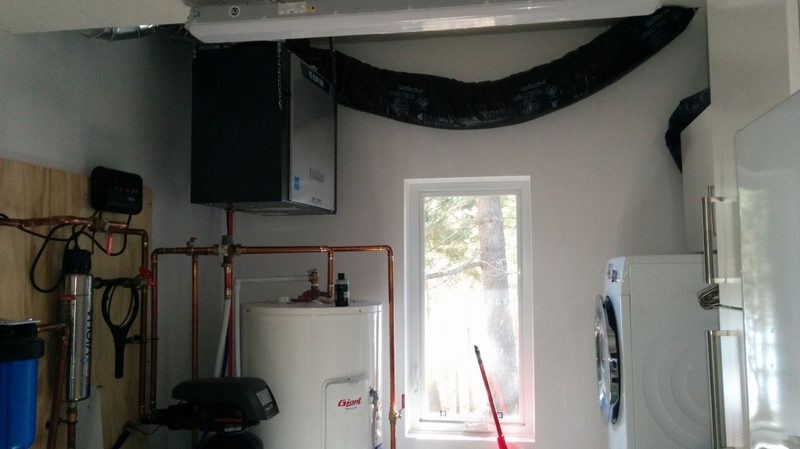 We’ve placed the heat-pump water tank in the home’s laundry/mechanical room, so now every time the couple does laundry, they’ll also be heating water, by allowing the heat-pump water tank some extra hot air! Another benefit to this heat-pump sucking up hot air is that it keeps the house’s interior cool in the summer. On the house’s sleek exterior, a solar array sits unobtrusively on the flat roof. The array was installed as a separate building phase, after construction was finished, and is part of Ontario’s MicroFIT Program, collecting solar energy and feeding it back into the grid for a profit. Though technically, it’s impossible to say whether the solar power collected is the same energy the house uses, the house actually collects more energy than it uses, which is an exciting feat! There it is, Frontenac’s systems in a nutshell! Next time, we’ll be going over the home’s modern and stylish interiors. Stay posted! 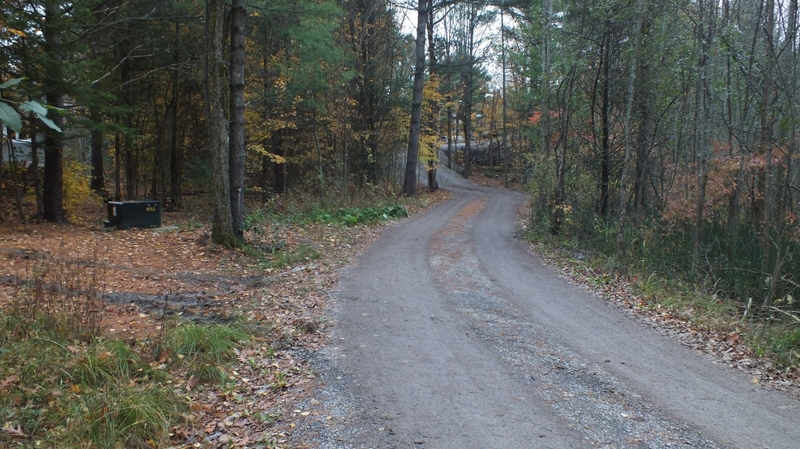 We’ve talked about Frontenac House’s location, in the rural cedar woods of Frontenac County, Ontario. We’ve talked about its modern, one-floor design; its ZIP wall sheathing; and its Roxul Mineral Wool insulation. We’ve talked about its solar panels and its mostly electric systems. Now, it’s time to talk about what’s going on inside the house – the colours on the walls, the countertops and cabinetry, the floors and the furniture. The home’s interiors are modern and sleek, with a touch of natural elements like warm wooden floors and kitchen cabinetry and huge, floor-to-ceiling windows that seem to bring the forest right into the space. The walls were painted white, the perfect backdrop for our client’s large art collection. 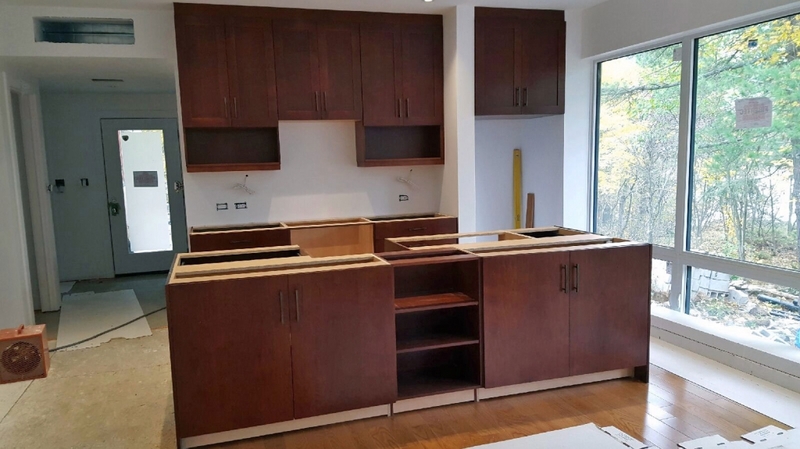 The kitchen cabinetry was done by a local carpenter, which is a lovely, unique change from our normal IKEA cabinetry! Don’t get us wrong, we love IKEA cabinets, as they’re formaldehyde-free, low VOC, attractive, AND affordable. But, everyone and their mother seems to have an IKEA kitchen! We’re always happy to be able to feature local talent, and the warm chestnut kitchen is a beautiful statement in this home’s Great Room. The exterior matches the interior’s warm-yet-sleek aesthetic. The glass of the windows reflects the trees and sky, and the black steel siding almost makes the home disappear into the shadows of the forest. The porch is pre-finished, solid wood from a Canadian company called Maibec. And what’s especially cool and unique about the wooden porch? The colour of wood was selected to match the colour of the dried pine needles that fill the forest floor. Construction on this house was a breeze, thanks to our amazing builder, Mike McGonegal of Reeves Fine Homes, a local builder from Kingston. He made sure the project ran smoothly and quickly — the whole house was built in only 5 months! Thank you so much for all your hard work and dedication, Mike! Next time we talk about Frontenac, we’ll be tying up loose ends and sharing the final photos! It’s been so satisfying watching this house come together. It’s about time for our final blog post on Frontenac House! The house has been finished for a while, but we weren’t ready to say goodbye until now. With spring – hopefully! – just around the corner, it seems fitting to tie up loose ends and start something fresh. So, we’re saying goodbye to Frontenac House, to make room to blog about a new project we’re really excited about: Eco Flats #1. But that’s all we’ll say about that here – stay tuned for more news on our newest blog project, starting very soon. Frontenac House’s finished photos – not to mention the home itself! – are gorgeous. Our photographer Derek Monson did an amazing job in showing the home’s chameleon-like ability to blend beautifully into the landscape. From the outside, the windows reflect the surrounding lush forest. And from the inside, it’s almost like you can step right out onto the forest floor, thanks to the Great Room’s floor-to-ceiling windows. Thank you for your fantastic photography skills, Derek! We also need to thank Jered Gudbranson and Tom Knezic, for their hard work designing this super-efficient gem. 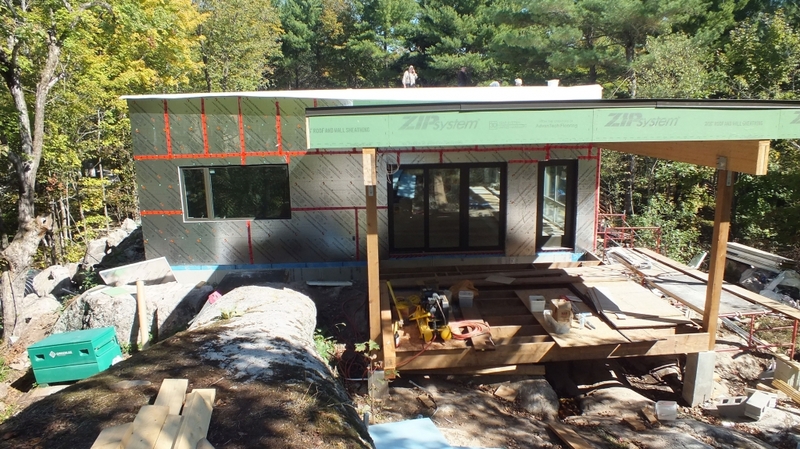 At 0.59 ACH@50Pa, this house has one of our most airtight envelopes, falling under Passive House’s rigorous standard of 0.6ACH @50pa! Plus, our clients have let us know that their rooftop solar panels, installed just after construction and linked with Ontario’s MicroFIT program, collect more energy than the home produces! Not only does this house compliment the landscape aesthetically, but it also makes an impressively minimal impact environmentally. Sweet! Thank you to our builder Mike McGonegal, of Reeves Fine Homes, for the beautiful craftsmanship in this gorgeous, contemporary home. And finally, thank you to our clients, for being so positive and communicative throughout the whole journey! We love hearing from you about the things you love about your new home. Enjoy your rural paradise!